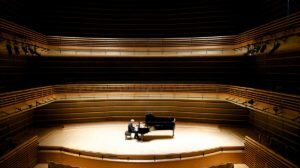 A founding resident company of the Kimmel Center for the Performing Arts, the Chamber Music Society presents concerts at the Kimmel Center's intimate Perelman Theater, as well as in collaboration with the American Philosophical Society, the Pennsylvania Academy of Fine Arts, and other Philadelphia cultural institutions. If you’re reading this, you may be joining us soon for a concert, and we couldn’t be happier. We care deeply about engaging with new audience members and ensuring that you have a great experience and will want to return. The following are questions that we have been asked by first-time audience members. If you'd like any additional information, just let us know on Facebook or by email, or give us a call at 215-569-8080. We look forward to hearing from you! 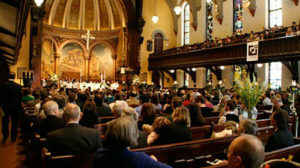 Concerts take place at the Kimmel Center's intimate Perelman Theater and other convenient Center City locations, including the American Philosophical Society's Benjamin Franklin Hall; the Rhoden Arts Center at the Pennsylvania Academy of Fine Arts; and the Church of the Holy Trinity on Rittenhouse Square. For complete venue information, see our venues page. A key part of our mission is to make leading artists and great music accessible to everyone in our community. We achieve this by keeping our ticket prices as low as possible, and through our education and outreach efforts. Even lower-priced full season passes are available for students (age 35 and younger) and young friends (age 40 and younger), and individual student tickets cost just $10 each. Discounted tickets are also available for groups of 10 or more. Our box office staff loves this question and would enjoy walking you through the options. Don't hesitate to give them a call (215-569-8080) for their assessment of the seating options at any event. Acoustics are often best up in the balconies (ideally in the center). Box seats at the Perelman Theater provide the most legroom and are the most accessible, and aisle seats are also very convenient (which is why these seats sell out quickly). If you have a seating request or special requirement, please note them at checkout, and our box office staff will do their best to accommodate you. Whatever you want! There's no dress code at our concerts. Whether formal or casual, we just want you to be comfortable and enjoy the music. How can I study up before I go? From playlists to videos to preview notes, the concert pages on our website are a great place to start. If you're on our e-mail list, we'll also send you a bunch of handy info a few days before your concert to help you get ready. Go figure, but we all also really love talking music and artists. Give us a call anytime, drop into our office, or stop by our box office table before the concert, and let's chat. Most concerts run between an hour and a half and two hours. Program lengths can vary, though, so check the preview notes on the concert page and our pre-concert emails (sent 2-3 days prior to each performance) for the most precise timings. Most concerts feature a 15-minute intermission about midway through the performance. Applause is generally reserved for the conclusion of a piece so as not to disturb the concentration of the artists. When you're blown away by a performance, by all means go wild! No one likes phones ringing or making other noises during the performance, so we ask that you silence yours before the performance starts. We do encourage you to share your experience with others, though, so feel free to check in on Facebook or snap an Instagram shot before the performance—just make sure your phone is on silent during the concert out of consideration for the artists. Convenient parking is available at all our venues, with discounted parking offered at many locations. Check each venue page for a list of options, or if you're receiving your tickets by mail, a list of parking options and prices is included in the envelope with your tickets. What if I can't make it to the concert? Don't worry, our exchange policy is extremely flexible. Provided you contact us before noon on the day of the concert, we'll happily exchange your tickets for another PCMS event (subject to availability) free of charge. 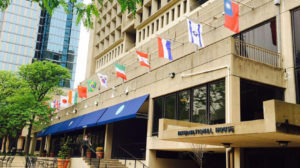 Please note if you are exchanging discounted tickets or going from a non-Kimmel Center event into an event at the Perelman Theater, there may be an additional balance on your order. What if the concert I want to attend is sold out? Due in part to our exchange policy, we often have a handful of tickets returned in the days before a concert—and we make it our mission to get those tickets right into the hands of people who want to go. So if a concert that you want to hear is sold out and your plans are somewhat flexible, join the waiting list for that performance by giving us a call or shooting us an email. We'll note your request and be in touch if and when seats open up. While we can't guarantee it, the waiting list works more often that you might think—and if it doesn't, it won't be for lack of trying on our part. An experience that is fundamentally human, and yet transcendent, shared with a group of people who love great music and believe that it should be accessible to everyone. Have a question that’s not answered here? Send us a message on Facebook or by email, or give us a call at 215-569-8080. All PCMS venues are handicapped-accessible, and accessible seating is reserved for patrons with special needs. When ordering your tickets, simply inform the box office of any accessibility concerns, and we'll do the rest. Please note: patrons attending concerts at the American Philosophical Society should call the box office in advance for accessibility instructions. Light fare and beverages are available at concessions areas in the Kimmel Center, and Volvér Restaurant by Chef Jose Garces offers a pre-concert menu, cocktails, and more. Learn more about the Center's dining options here. 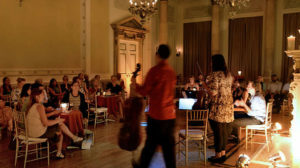 At American Philosophical Society concerts, we host a "Social Series" of curated tasting events that connect our audience with our area's finest purveyors of food and drink. These complimentary tastings take place before the concerts and at intermission and highlight cheesemongers, brewers, chocolatiers, vintners, bakers, coffee roasters, and more. Tea, coffee, and light snacks are also available for a nominal price at our concession table. About half of our events feature a free pre-concert lecture with a respected musical scholar or composer. 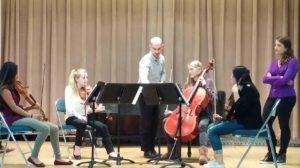 These informal talks are designed to deepen your connection to the music that you're about to hear. Weeknight lectures begin at 6:30 pm, and Sunday lectures begin at 1:45 pm. All lectures at the Kimmel Center take place in the Comcast Circle unless otherwise noted. There's nothing we love more than connecting with our audience. Our staff attends every concert and is genuinely eager to hear from you about your experience. So stop by our box office table, tell us your thoughts, and come back again and again. A member recently told us, "I feel like I'm coming home when I'm here," and we hope to share that communal feeling with you too.